The Management Committee at Oundle Museum are very pleased to announce that we won the Best Volunteer Project Award at the 2018 Northamptonshire Heritage Award’s held on 5th July at Althorp House. We were so thrilled to accept this Award in recognition of our hard work with the exhibition this year ‘Farming Now and Then’. We are delighted to report that Oundle Museum was awarded Best Exhibition for our ‘Oundle 1851’ Exhibition at the Northamptonshire Museum and Historic Houses Forum’s Heritage Awards. 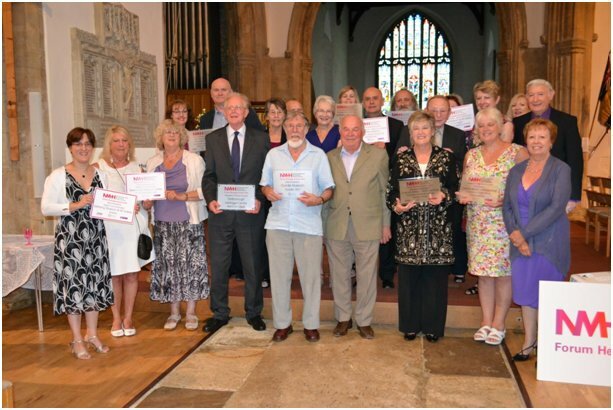 The Awards celebrate the County’s outstanding heritage through the work of almost 50 museums, historic houses and other historic organisations. Oundle Museum is run by volunteers under the auspice of the Oundle Museum Trust which is a registered charity (No.1045378). The trust consists of several Town Council Members, four members of the Museum Management Committee and an Arts Council advisor. The Museum is run on a day to day basis by a Museum Management Committee of 12 members who all bring varied skills and experience. All of the Committee are volunteers from the town and its surrounds, several of whom have served since the Museum’s foundation in 1994. The volunteers change the Museum theme every year to educate and interest the community in its long and varied historical heritage. There are some 50 volunteer stewards who man the Museum at opening times throughout the year which makes for a dedicated facility, created by the community for the community. The Museum is open March to November on Saturdays 11.00am to 5.00pm and on Sundays and Bank Holidays from 2.00pm to 5.00pm. In August we are also open every Thursday and Friday from 11.00am – 4.00pm. The Museum can also be opened for groups by special arrangement. Admission is free, although being self-funded we welcome donations. Should you wish to participate then please visit the Friends Page. How and when did it all start – and why did Oundle not have a museum before 1994? The Museum was officially opened on the 28th May 1994 in the Drill Hall on Benfield Road. The origin lies in a group of people who became friends in 1981 through studying a course on the history of Oundle. This led to a small exhibition held for three days in the Yarrow Gallery of Oundle School and from that Oundle Historical Society took root. Ten years later the need for a museum had become clear. The Town Council encouraged this idea and offered the upstairs room in the Old Drill Hall at a peppercorn rent. Very helpful advice was given by the East Midlands Museum Service, an organisation which was set up with the support of local authorities and museums in the area funded by an annual subscription. A visit was arranged to a newly started museum near Nottingham and many useful ideas, especially about the need for good storage and for keeping records, were taken aboard. The Town Clerk and one of the Councillors gave a great deal of help in establishing a suitable structure for the organisation, writing a constitution and making contact with the Charity Commission. The organisation which was set up may have been rather unusual because the eight Trustees were made up from representatives four existing groups, the Oundle Historical Society, the Mid-Nene Archaeological Group, the Oundle Buildings group, and the Oundle Group of the Northamptonshire Wildlife Trust – and four Town Councillors, the Chairman to be the Mayor. The Trustees meet four times a year and this structure has served the Museum very well. A move to the Courthouse with a larger museum display area along with office and storage space occurred in 2000 with the help of a Heritage Lottery Grant. Oundle Museum achieved ‘Accreditation’ status in 2007 which is a scheme that sets nationally agreed standards for museums in the UK. Since Oundle Museum opened it has been possible to build up the collection and archive, though storage space is very limited. To maintain careful records of acquisitions and loans made for current exhibitions. Items associated with Oundle Smiths Brewery donated by the late Jim Irving, who was the last Manager there, are a remarkable feature of the Museum. The range in our collection, together with the willingness of people and other museums to lend articles has made it possible for a different theme to be displayed each year since 1994.